Colin Foster and Torey Thornton show collaborative work as well as individual work in the current exhibition at Freddy Gallery, Rigor Raging Rigger. On entering, the compact space is crowded by a large floor pedestal that supports a sci-fi acrylic and wood table. On the table, a variety of objects sample one substance for this, another substance for that, forming an array of shapes that seem to have neither history nor future. To the left, a large red transparent vinyl covers the front window. A few wall pieces by Thornton experiment with the context of OLD WOOD (which, in the context of particle board and depicted gum in one piece, I can’t help but think of as a sign increasingly owned by yuppie food establishments). A blue, “+” shaped cardboard collage is forgettable/unnervingly tidy in the mad (material) scientist atmosphere that everything else works to establish. Foster’s pieces each seem to embed some sort of overwhelmingly human narrative within their otherwise industrial/analog electronic Hobby Hell aesthetic. 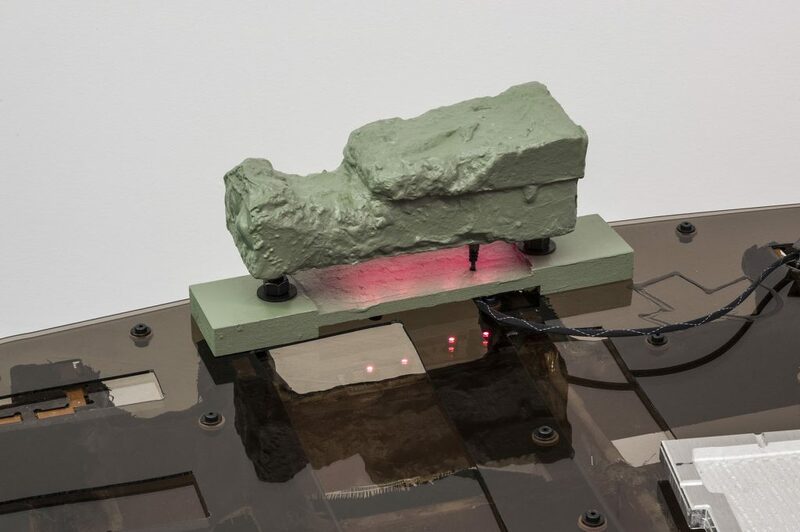 The link between these practices seems to stem from a material dissonance — an ambivalence towards just how comfortable both might be with the found and manipulated material vernacular available. I see a sort of flattened timeline of cutting edge and antique materials, of natural and unnatural qualities forced to interact outside of their themes. Where Thornton’s work remains relatively sober, Foster’s work feels erratic and difficult to parse. Though Top Ribbon (Disturbed Mono) by Thornton and Selling Shoes on the Beach by Foster are both non-collaborative, they mark where the artists most closely brush shoulders in practice. They seem to be the strongest pieces in the show in their ability to point to that link (a squished material timeline) and employ the separate strengths of each artist’s practice. That the gallery text and title offer a roll of possible labels that function more as phonetic textures (pick your poison: beatnik poetic, summer camp icebreaker, dada, hashtag list?) than as specific descriptors is a nice coupling for work that relies so heavily on the physicality of objects. As a collaboration, Rigor Raging Riggeris a treat to explore even with the few pieces that seem engaged in a different conversation. Thornton’s blue “+” still seems unfitting here, but the formal effort to match it (or to be matched by?) 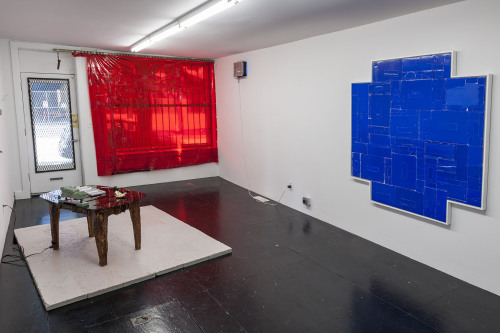 Foster’s large red vinyl window highlights the conscious efforts of the two to commit to the sort of material choreography that ultimately holds the show together. Perhaps a second collaboration is the stage for further grace in that dance—I’d be curious to see it.